Three winter storms will move into San Diego, beginning Wednesday evening, and lasting through Monday night. Heavy rainfall and possible thunderstorms will be enough to cause flooding. The first storm will move in, late Wednesday, and bring rain Thursday. Another storm will move in Friday. There is a chance of showers on Saturday and Sunday. The final storm in this series is expected Monday. “Monday should be the biggest storm,” said NBC 7 Meteorologist Jodi Kodesh. 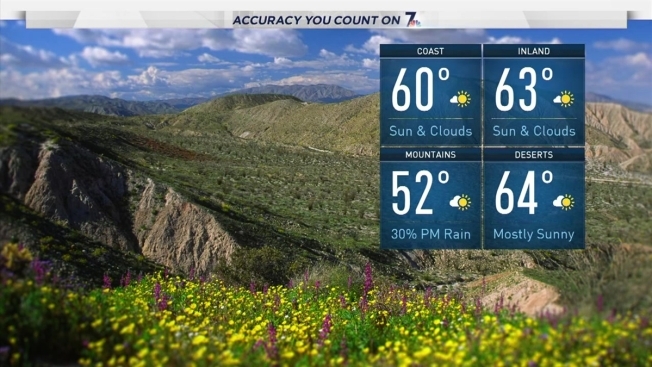 Check the NBC 7 forecast here. Preliminary rainfall totals following the weekend are estimated to be 2 to 4 inches along the coast with 3 to 5 inches in the valleys. In the mountains, we could receive 5 to 10 inches of rainfall with snow predicted above 5,000 feet. Snowfall could measure between an inch and five inches in some areas with the higher peaks receiving 7 inches to a foot of new snow. Farther east, residents in the upper desert areas could see an inch to 3 inches of rain with slightly less (1 to 2 inches) in the lower deserts. Wednesday: A sun and cloud mix, with a high of 61. Wednesday evening: A chance of showers after 10 p.m., with rain becoming likely after 4 a.m. The rain could be heavy at times. Low around 53. West wind, 10 to 15 mph. Thursday: Rain before 10a.m., then showers likely for the remainder of the day. There is a chance of thunderstorms. High near 60. Southwest wind 10 to 15 mph, with gusts as high as 20 mph. Thursday evening: Showers likely. Low around 53. Friday: Rain. The rain could be heavy at times. High around 58. Friday evening: Mostly cloudy, with showers. Low around 52. Saturday: A chance of showers. Partly sunny, with a high around 58. Saturday evening: A slight chance of showers. Partly cloudy, with a low around 50. Sunday: A slight chance of rain. Partly cloudy, with a high around 61. Sunday evening: Rain. Mostly cloudy, with a low around 53. Monday: Rain is likely. The rain could be heavy at times. High around 59. Monday evening: A chance of showers. Mostly cloudy, with a low around 51. Tuesday: A slight chance of a morning shower. Partly cloudy, with a high around 59. Make sure to download NBC 7’s free news app. Weather alerts, like flood advisories warnings are issued through the app. There is also a local, interactive radar.